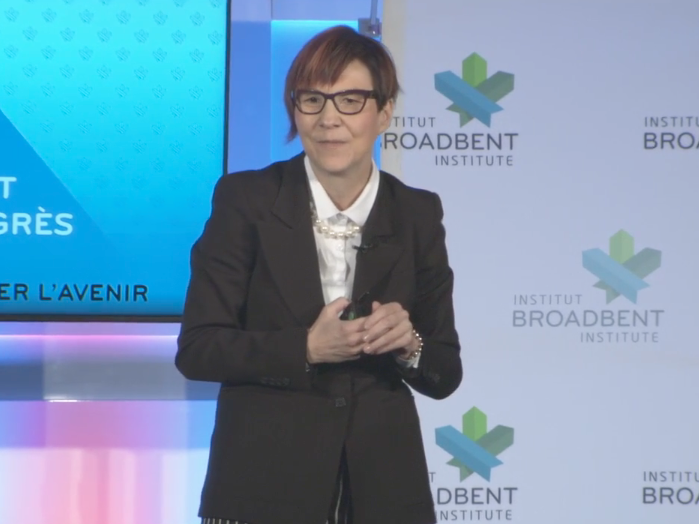 Cindy Blackstock will likely be remembered one day as one of the greatest human rights advocates in 21st-century Canada. As she walked out on the stage to address a full house at the second annual Progress Summit in Ottawa this past weekend, she received a standing ovation for her tireless work in seeking justice for First Nations children. “So welcome to Algonquin territory, all of us,” she said happily in her opening remarks. For the next 20 minutes, Blackstock captivated her audience with cold hard facts on how the federal government — past and present — knowingly underfunded First Nations child welfare services in Canada. According to Blackstock, previous federal governments allocated between 22 to 30 per cent less money for First Nations children welfare programs than the provinces spend on the same programs for non-Indigenous children. “A lot of people say that dealing with First Nations children issues, because there is so many of them, it makes us complex. But my mom always had a good saying for that. She said when people say things are complex, look for the obvious, because almost no one does,” Blackstock continued. Cindy Blackstock addressing the Progress Summit in Ottawa. “As race and/or national or ethnic origin is a factor in those adverse impacts, the Panel concluded First Nations children and families living on reserve and in the Yukon are discriminated against in the provision of child and family services by AANDC (Aboriginal Affairs and Northern Development Canada),” the Tribunal’s ruling states. “What the Tribunal found was that for the first time in the world, a developed country, our country, was found to have racially discriminated against 163,000 children,” Blackstock told her audience. The recent federal budget provides approximately $71 million for First Nations child welfare programs for the 2016/2017 fiscal year. Blackstock’s organization argues the amount falls $129 million short of what is needed to provide immediate relief for on-reserve children depending on welfare services. Blackstock said that during the nine years over which former prime minister Stephen Harper’s government “vigorously” fought the case, the federal government never disputed that it was treating First Nations children unequally. “The federal government tried eight times to get [the case] dismissed on this basis. They said it is unfair to compare the level of services we provide to First Nations to the level of services the provinces provide to everybody else,” recalled Blackstock. Blackstock slammed the Canadian government for willfully ignoring chilling statistics such as First Nations children being 12 times more likely to wind up in foster care than non-Indigenous children, and the cumulative 66 million nights between 1989 and 2012 that First Nations children in foster homes have spent without their parents. “It is our job as adults to stand up for the kids, isn’t it,” she said calmly. A chapter of the First Nations child welfare services case that Blackstock did not discuss in her keynote was the Harper government spying on her while the human rights complaint was before the Tribunal. By 2011, Blackstock had obtained under the Privacy Act a 2,500-page file that the federal government kept on her activities. The privacy commissioner at the time ordered the Harper government to end its surveillance operation. First Nations Child and Family Caring Society of Canada, along with the Assembly of First Nations, launched the complaint with the Canadian Human Rights Tribunal in 2007 on behalf of the over 160,000 First Nations children who are in or have gone through foster services in Canada. The total exceeds the number of Métis, Inuit and First Nations children forced into the residential school system. Canada has only recently woken up to the wrongs that successive federal governments committed against Indigenous children in the past. Now, because of Blackstock and those working with her, Canada will have to address the harm it is causing Indigenous children presently. “If you want to make reconciliation real, I think it begins with not saying sorry twice,” Blackstock said before exiting the stage. Blackstock is a member of the Gitxsan First Nation in British Columbia and an adjunct professor at the University of Alberta. She is currently the executive director of First Nations Child and Family Caring Society of Canada.